Balancing invincible technical accuracy and virtuosity with rigorous intellectual and spiritual stimulation, Claudio Arrau played to probe, divine and to interpret the will of the composer, always faithful to the text. He viewed technique and virtuosity as inseparable from musical expression and constantly stressed the expressive, spiritual and creative power of virtuosity while downplaying its sensational aspect and suffusing every note with meaning. Eschewing superfluous gestures, his naturally relaxed manner of playing resulted in a very distinctive sound of amazing clarity, great tonal depth, nuance and beauty which could fill a concert hall with no apparent physical tension. Arrau's career spanned the developments in sound recording from the acoustic era to modern digital recording and he emerged on those upland plateaus where the real heroes of music dwell. But he never remained on those plateaus as he explained in an interview in 1960: "It's a question of evolution. Any artist who is alive develops all the time and what he thought was good a week ago is bad a week later." Through the best part of the 20th Century, every recording of Arrau's was considered an event. This was much helped by the close and warm, glorious sound the Philips engineers gave him on his records, starting with the Beethoven sonata cycle through to his recording of Bach's G Major Partita, recorded only months before his death at the age of 88 in 1991. 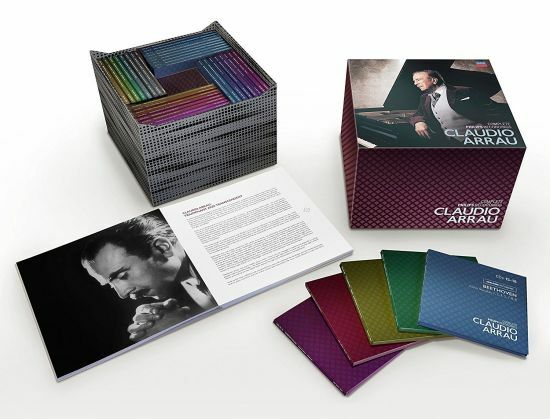 Limited Edition 80-CD set presenting Claudio Arrau's complete Philips and American Decca recordings plus his live recording of Beethoven's Piano Concerto No.4 with Leonard Bernstein (Amnesty International) on Deutsche Grammophon. Arrau was among the most deeply satisfying interpreters of Mozart, Brahms, Schumann, Liszt, Chopin and particularly Beethoven.